By the late 19th century a conflict had arisen between astronomy and geology. Geologists had determened that the Earth was very old, perhaps even billions of years old. However, physicists studying the sun, could not think of any other source of the sun’s heat other than gravitational contraction, which would not allow the sun to be so old. Today, we know that extremely slow nuclear fusion reaction is responsible for the sun’s energy and it is consistent with its old age. This solar fusion, primarily between two protons, happens via a quantum tunneling phenomenon. As life on Earth would have been impossible without the existence of the sun, life is indirectly dependent on quntum tunneling. Quantum tunneling also has a direct influence on life. This has led to a new field, which has been called sub-molecular biology or “quantum biology”. Proton tunneling in DNA can change genetic code and give rise to mutations. Finally I shall discuss quantum tunneling in condensed matter physics and materials science. This gives the ability to observe single atoms, carry out experiments on single atoms, manipulate atoms and drag atoms one by one to build fascinating nanostructures for quantum technology. Quantum tunneling is used not only for the fabrication of nanostructures, but also to investigate how the electrons behave in such structures. A preliminary idea about how quantum tunneling can contribute towards fabrication of quantum bits, which are the building blocks of quantum computer, will be given. Prof. Dev is a Senior Professor in the Department of Materials Science at Indian Association for the Cultivation of Science, Kolkata. He received Ph.D. in Physics (1985) from the State University of New York at Albany, USA. 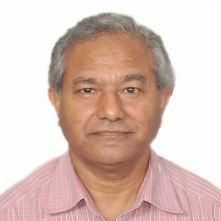 He worked as a Guest Scientist at Hamburg Synchrotron Radiation Laboratory (HASYLAB) at DESY in Hamburg, Germany and then returned to India and joined Institute of Physics (IOP), Bhubaneswar in 1988. There he set up a research programme on clean surfaces of materials under ultrahigh vacuum condition in the broad area of “Surface and Nanoscale Science”. The facilities developed include molecular beam epitaxy (MBE) growth and scanning tunneling microscopy (STM). He designed the world’s most compact MBE facility. He also set up research facilities for condensed matter physics and materials science using accelerated ion beams and standing waves of X-rays. In 2006 Prof. Dev moved to Indian Association for the Cultivation of Science (IACS), Kolkata. At IACS he set up an integrated facility including MBE, STM and photoemission electron microscopy (PEEM). Prof, Dev’s major areas of research have been ion-solid interactions, X-ray physics and epitaxial nanostructures on surfaces. He has supervised 20 Ph.D. theses and published over 150 papers. Prof. Dev is a member of Editorial or Advisory Editorial Board of several international journals. As principal investigator, he has carried out international bilateral Indo-US, Indo-German and Indo-Japan collaborative research projects. Prof. Dev is a Fellow of the Indian Academy of Sciences, National Academy of Sciences India and West Bengal Academy of Science and Technology. Among the several awards Prof. Dev received are 2009 DAE-Raja Ramanna Prize in Physics, the 2010 International Alumni Award for Exceptional Achievement from the University at Albany, State University of New York, U.S.A. and the MRSI Distinguished Lectureship Award for 2015-16.